‘Lene Kuhl Jakobsen and I have worked together on a number of local community projects aimed at raising awareness of artists in our community over a span of about 15 or more years. Although we haven’t set out to develop a series of collaborative pieces before, we were presented with an opportunity to do so recently, which raised a challenge that we both grasped as a way of developing new works, combined and individually in response to ideas explored collaboratively. This was an opportunity to explore new directions that may lead to greater works in the future. There are many creative people in the Slovenian Australian community. Some of them have gained international recognition yet the community often remains unaware of the extent of their achievement. Andrew (Andrej) Potočnik is one of them: his works in wood awe and inspire many woodworkers as well as art lovers in Australia and overseas. While he is well known to the readers of magazines such as the Australian Wood Review, Woodturning and American Woodturner, we as a community should perhaps get to know him better too. Every enthusiastic woodworker knows how hard it is to turn a piece of wood into something useful, such as a bowl or a jewellery box. It requires a lot of skill to turn it into a high quality finished product. It takes, however, an artist to turn it into a piece of art. Andrew Potočnik is an accomplished and highly skilled artist. His CV lists twenty-two exhibitions in Australia and the USA; his works are owned by art museums and galleries worldwide (e.g., Los Angeles County Museum of Art, Contemporary Museum of Hawaii, Minneapolis Institute of Art to name just three from a much longer list) and his works appeared in many publications, such as The Art of Turned Bowls by Richard Raffan or Sacred Vessels published by the National Jewish Centre for Learning and Leadership in New York. Ever since childhood, whenever I wanted, or needed, to make something, I found wood to be the first material I turned to. It wasn’t always the best choice, but it was a material I felt comfortable with, and one that I could convert into whatever I needed. At high school, I met a teacher who encouraged creative use of wood, setting convention aside in order to encourage aspects that were radical at that time. He encouraged me to salvage and recycle wood, and even worse, he taught me to appreciate wood for its colour, smell, feel, grain and any other intrinsic quality it may have. With an introduction like this, where else could I go, but continue to explore all those wonderful qualities every piece of wood conceals, just needing a sympathetic cut to expose it to those who see it as nothing more than a renewable resource, ready to be exploited, rather than appreciated! Now, I gain enormous enjoyment from seeing how people from other cultures explore their wood, how they expose and celebrate its beauty, and how it’s integrated into their culture and general existence. As an artist, I continually find inspiration to explore new directions in creating objects from wood. As a teacher, I try to pass information on to my students, hoping that they too will be inspired to explore wood. Celebrating it as a living material that grows around us, as a material that can give voice to ideas conjured in our minds, as a material that says something about our culture and world. 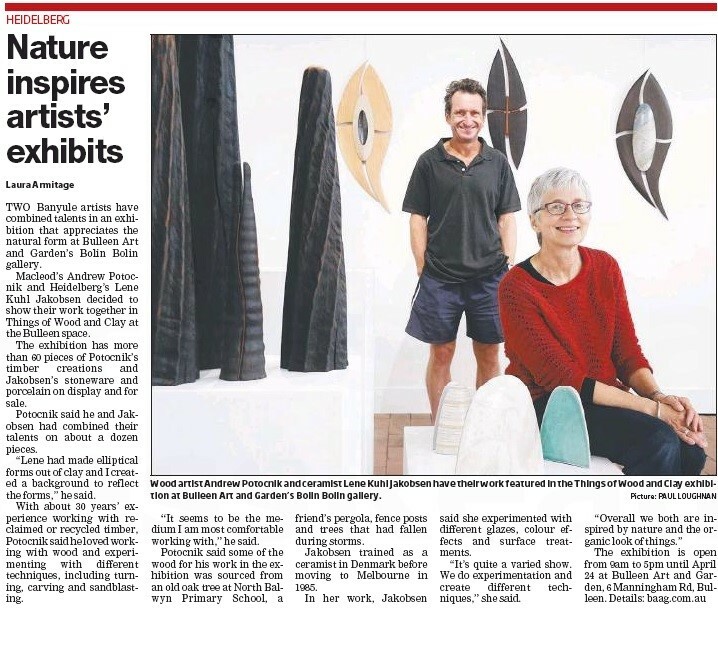 You can enjoy Andrew Potočnik’s work at Bolin Bolin Art Gallery in Bulleen, Victoria where he shares the exhibition space with another well-known artist Lene Kuhl Jakobsen. The exhibition “Things of Wood and Clay” opens on Wednesday, 23 March, and will remain open to general public from 24 March to 24 April 2016.